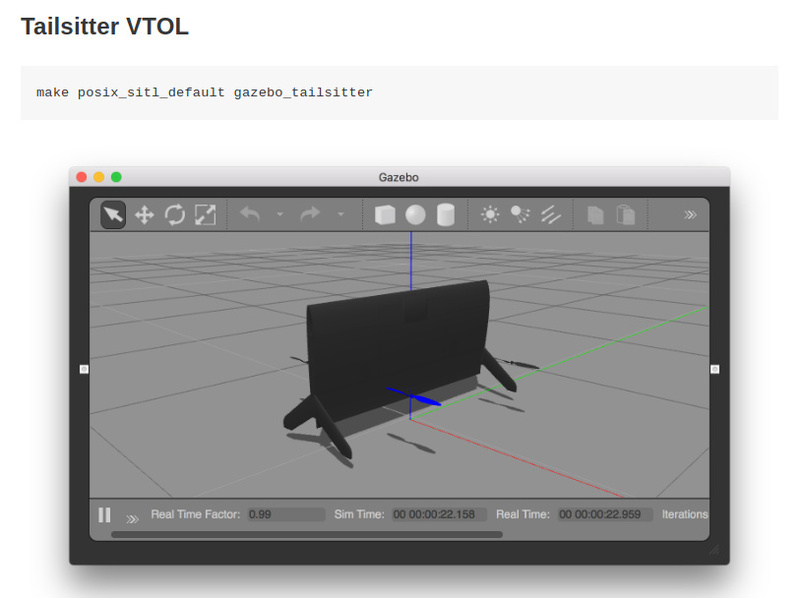 is it possible to use Gazebo to simulate hover of a Dual Motor Tailsitter VTLO? In this case Gazebo has to simulate the "forces" of the control surfaces in hover as well. Can Gazebo simulate this already? I'm not sure if Gazebo can do this, but I'm interested. Have you seen the quad tailsitter gazebo model? as gazebo can simulate quads and planes, this should be possible, we have to dig. Any help welcome ! @tumbili Would be great if you could chime in there. @dagar Yes, have seen the quad tailsitter. I think it will not use the force of the control surfaces in hover mode, but I am not 100% sure. I will get a bit deeper into this when I have some time. @Matthias_Favrel Hi Matthias, we have to figure out if it is as easy as simulating an airplane. There is no "airspeed" in hover mode, the "airspeed" has to come from the propellers, I don't know how complicated that kind of simulation is in Gazebo. Yes, I don't think we will manage this with proper air coming from the propellers, instead it should be possible to apply forces related by equation to the angle of the control surface. We should dig into the airplane model (I haven't found how it works at the moment), does anyone know how aerodynamic is modelled ?